It's been one week since Gil Scott-Heron's death and his body is almost at its final resting place but first there is a public viewing ceremony at the Campbell funeral home in New York later today. By 62, Gill Scott-Heron had put his body through more than most people could stand let along live through. Lets try not to let this fact distract us from the creative wake this incredibly gifted man has left behind. R.I.P. 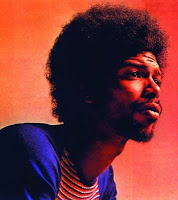 Gil Scott-Heron.You will be missed.